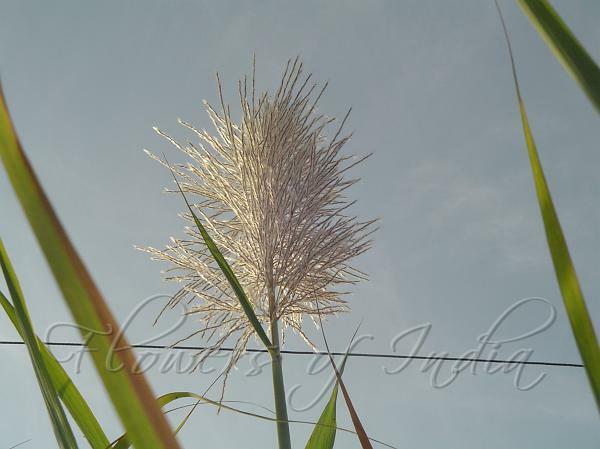 Sugarcane is a plant which is actually a giant grass. The stem is jointed, 3–5 m tall, 2–3 cm thick, solid juicy, the lower internodes short, swollen; sheaths greatly overlapping, the lower usually falling from the culms. Leaf blades elongate, mostly 4–6 cm wide, with a very thick midrib. The white flowers appear in plumelike panicles, 20–60 cm long, the slender racemes drooping. spikelets about 3 mm long, are obscured in a basal tuft of silky hairs 2–3 times as long as the spikelet. 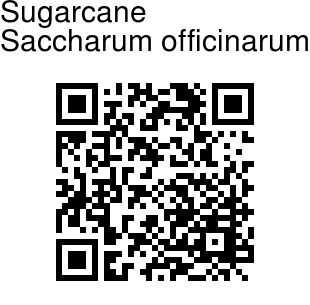 Cane sugar, cane syrup, molasses, wax, and rum are products of sugarcane. Fresh cane stems are often chewed, especially by poorer people. The young unexpanded inflorescence is eaten raw, steamed or toasted, and prepared in various ways.